Part of the fun of going on holidays is staying in a hotel and being waited on 24/7. The more plush the surroundings and impeccable the service, the more you enjoy your stay. But have you ever wondered what it’s like for those whose job it is to cater to your every need? It’s one challenge after another! In Hotel Dash: Suite Success, you get to experience hotels from their perspective. In this charming Time Management game (a part of the Dash series), Quinn decides to branch out from Wedding Planning to Hotel Management. Her first challenge is to renovate the Honeymoon Suite at The DinerTown Suites. The pressure’s on because she knows the couple personally and has very little time to get the room ready, but as we get stuck into the game, it becomes apparent that the heroine of this game is actually not Quinn, but the hard-working Flo, who steps up once again to help her friend achieve her ambitious new career goal. Flo will rely on YOUR keen eye and efficient timing to help serve the hotel’s guest, keep them from becoming impatient if she gets busy and takes too long to tend to their requests, and keep them happy enough to shower her with tips that she can use towards renovating the hotel. She’ll have to deal with plenty of obstacles along the way too, like sabotages, ghosts, and guests who don’t get along with each other. All in a day’s work at Diner Dash: Suite Success! 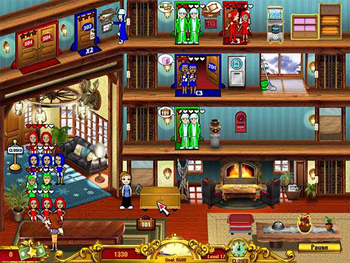 The game features two different modes: Story and Endless. 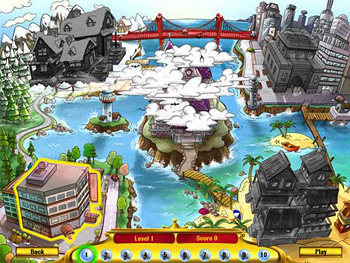 The Story Mode includes five different hotels with ten levels each. Your aim is to reach the “expert goal” and earn enough money towards renovating the hotel one level at a time. The Endless Mode is more challenging and will appeal to more experienced Dash players. 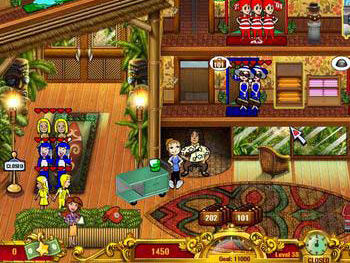 You can choose between three levels of difficulty and must survive for as long as possible without losing any more than five guests during the game. As guests arrive at the Hotel’s Front Desk, Flo must usher them to their rooms. Here’s a tip: Match guests by the color of their clothes to the color of the rooms to increase your bonuses. You’ll want to check in small parties to the smaller rooms and larger parties to the larger rooms to accommodate as many guests as possible at the same time. With every level, you can upgrade a room by awarding it another star. Guests who stay in Star Rooms give bigger tips and give you Star Bills when they leave, so you’ll want to give them the best service possible. Guests will make all sorts of requests throughout the game: They’ll want their luggage delivered quickly, Room Service, more towels and pillows, fix plumbing problems, organize wake-up calls and more. Using the hotel elevators, fast shoes and a cart to deliver items – which you can upgrade throughout the game to increases its capacity – Flo must deliver all of it to the guests as quickly as possible. Here’s another tip: Customer satisfaction is measured by a number of red “hearts”. As their impatience rises, the hearts turn from red to white. When they’re all white, they’ll usually storm out of the hotel or shut the door on you. So pay attention to the color of the hearts for each party. If you can see their patience is almost up, you’ll want to hurry and serve them to keep them from leaving or getting upset. When the gift baskets arrive, make an effort to deliver them to empty rooms before guests check in so that they get a nice surprise when they are checked in and give you a tip! And another tip: When guests check out, get rid of their dirty laundry as quickly as you can to make way for new guests to check in. At the end of each level, the money you earn from all the tips will go towards buying upgrade for the hotel. As she goes about her day, Flo will have to deal with all sorts of guests with different patience levels, preferences and behaviors. One of the challenges of Hotel Dash: Suite Success is to learn these differences so that you can incorporate them into your play strategy. For example, VIP guests won’t let other guests go past their rooms if they stand outside waiting for something, ghosts will spook other guests, the fashionista will bring more luggage than the others, etc. Hotel Dash: Suite Success has a charming storyline, cute graphics, and fun twists that will delight Dash fans. While the level of difficulty isn’t always as challenging as more experienced Dash players might expect (especially in the Story Mode), the game is still fast-paced enough to entertain. If nothing else, it will give you a whole new appreciation for what hotel staff goes through to keep guests happy and deliver top quality service! Download and play the full version of Hotel Dash: Suite Success for FREE! i can’t wait to try this game i mean i’m only 10 years old but i hope ist gonna b fun!!!!!!!!!!!!!! !